Masterfully distilled from Gluten Free potatoes. With a smoothness and taste unmatched. Officialy crowned "The World's Best Tasting Vodka!". 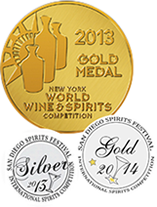 Awarded the 2014 Gold Medal at the San Diego Spirits Festival. As well as the 2013 Gold Medal Winner at the New York World Wine and Spirits Competition and the 2013 Silver Medal Winner at the San Diego Spirits Festival. The Irish strongly believe in a Loyalty that is unmatched anywhere else in the world when it comes to family, friends and excellence in anything that they do, always staying true to their Irish-Pride and Irish roots, it is this Loyalty and Pride that gives life to FÁILTE VODKA. Expertly crafted and masterfully distilled high in the valley at the foot of of the Grand Teton mountains in beautiful Idaho. Fáilte Vodka delivers quality and tastes in every glass.